Figs are one of the superfoods and are a nutrient dense fruit. They contain a high amount of calcium and are a great addition to anyone’s diet. Figs are rich in Vitamin C and topical use can help achieve a smooth and even toned skin. Figs are natural laxatives and help detox your body. Figs are delicious sweet fruits which have multiple benefits for your body. Whether dried or fresh they are equally useful and are packed with vitamins, minerals and fiber and have a great nutritional value. They can be incorporated in your diet by adding them to salads, having a few with your cheese course or mixing a few in your smoothies. Figs are also a part of some great home remedies for your skin problems. Here are some surprising uses and benefits of figs to achieve that flawless complexion and luscious hair. Figs health benefits include its ability to provide the much needed nourishment to your skin and regular use can prevent your skin from breaking out. Mash a couple of figs and add a teaspoon of honey to create a sticky mixture. Apply this mix on your skin using your fingers and leave it there for 15 minutes. Repeat this around 2-3 times per week and watch your acne fade away. Make a rich, nourishing exfoliator for your skin using figs. Take coarsely powdered sugar, fig paste or mashed figs and a few drops of lemon to achieve the desired consistency. Use this scrub on your face and body to reveal healthy glowing skin. Figs contain a healthy dose of Vitamin C, which is great for achieving an even toned skin and removing any blemishes. Mix a tablespoon of fix paste with equal amount of yogurt and a dash of honey. Use this face mask to get rid of pigmentation and blemishes and get smooth even toned skin. Figs are rich in fiber and are also known for their laxative properties. Soak a couple of dried figs in water, overnight and take them first thing in the morning tocan help eliminate toxins by keeping the digestive tract clear and healthy. 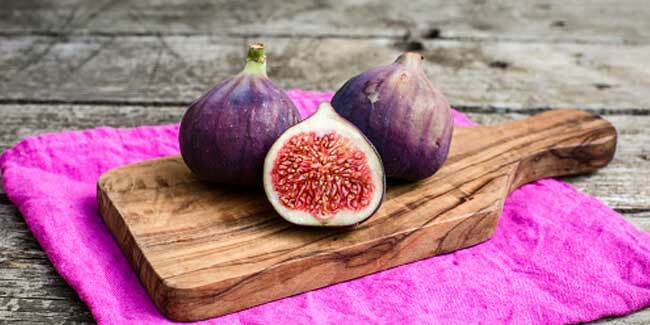 Figs have many vitamins and minerals which are essential for hair growth and health. These nutrients help create a suitable environment for hair growth and are beneficial for health of hair and scalp. Incorporate at least 2-3 figs every day in your diet to reap the amazing benefits of this superfood. Fig oil is a great conditioner which helps in detangling and moisturizing your hair. Add a few drops of fig oil in your hair mask to give a boost to your hair health and get a healthy and tangle free mane.